FSY Architects was honored to receive an ‘Excellence in Design’ Award from the San Fernando Valley Chapter of the American Institute of Architects for its work on BLOX, a ‘creative campus’ adjacent to the Los Angeles River. BLOX includes the adaptive re-use of two existing industrial buildings into live-work suites, and the construction of two new buildings for creative office use and a take-out restaurant, Wax Paper. FSY provided design as well as construction services for the development. 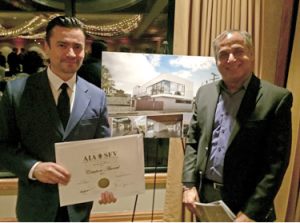 The design award was presented to FSY Architects at the AIA SFV’s annual design awards banquet on January 23, 2016 at the Woodland Hills Country Club.